Geotextiles are made from chemically-resistant synthetic fibers to prevent biodegrading. Geotextile fabrics are either knitted or matted together by heat-sealing or needle punching. Although all geotextiles are permeable, their mechanical and hydraulic properties can vary widely. 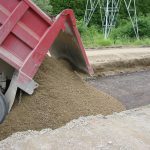 They are used in civil construction projects for soil stabilization purposes for roads, landfills, drainage structures, and more. Geotextiles help to make soft or poor soil more manageable. By reinforcing soft soil foundations, geotextiles help make construction possible in places that were previously not suitable to build on. Geotextiles are often used to separate two layers of soil with different particle sizes so that each may retain their integrity and function. 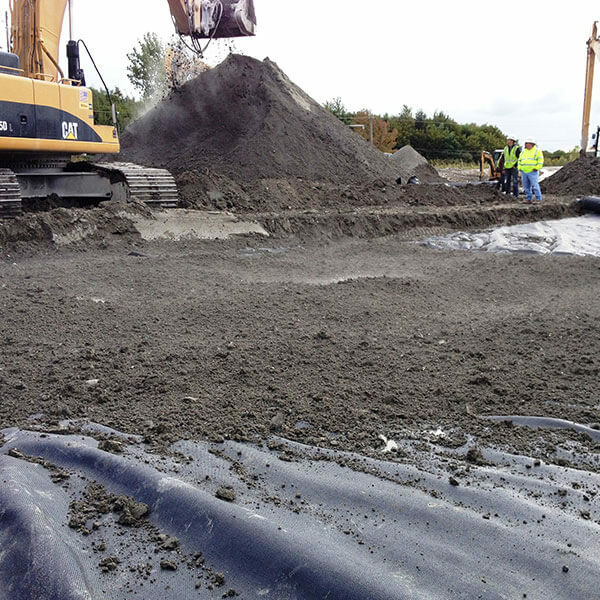 When water gets into the soil strata, the geotextile will prevent the soils from mixing together. The most important performance criteria for geotextile separation are AOS (apparent opening size), tear, tensile strength, permeability, and permittivity. Geotextiles act as a filter by retaining soil particles as water is allowed to flow through the soil. The most important performance criteria for geotextile filtration are AOS, permeability, and permittivity. 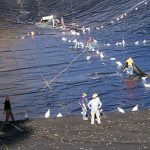 The geotextile fabric must also allow for adequate flow, proper soil retention, and resist clogging. Geotextiles can also act as a drain, gathering and discharging liquids or gases not required functionally by the structure. The most important performance criteria for geotextile drainage are mass, transmissivity, and permeability. Geotextiles act as a reinforcing element to the soil matrix helping to provide a stronger structural material. A geotextile must be able to transfer its strength to the soil it is reinforcing. It must maintain that strength for maximum effectiveness and allow water to easily pass through while filtering out fine materials that can weaken the soil. Because of the this, the most important performance criteria for geotextile reinforcement are grab strength, elongation, tear, and mass. 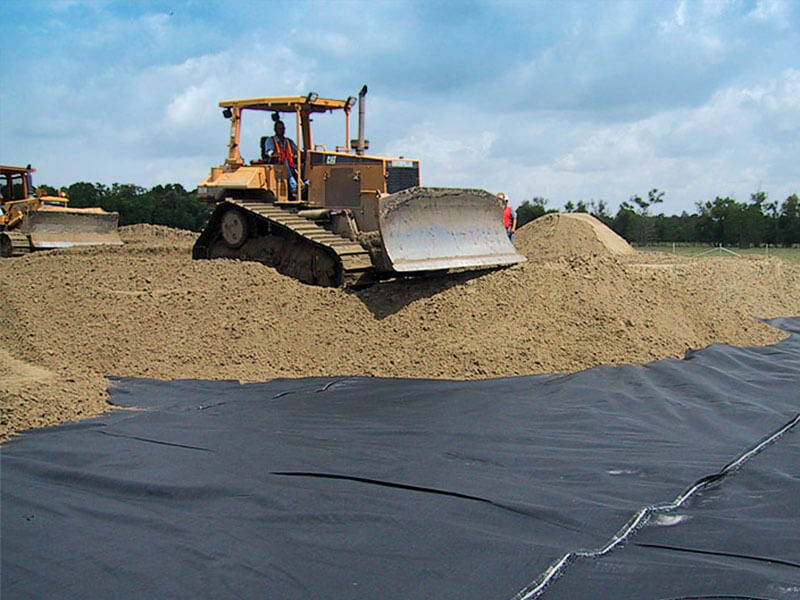 Geotextiles help to shield synthetic membranes from puncture, abrasion, and perforation. The most important criteria for geotextile protection are puncture resistance, mass, and burst strength. Woven geotextiles are made by weaving together polypropylene or polyester fibers. These type of geotextiles are mainly used for the functions of separation and reinforcement. Woven geotextiles are categorized by their tensile strength which is resistance to breaking under tension. With a plastic-like feel to them, woven geotextiles are impermeable which means they do not offer much drainage. Because of their high load capacity, woven geotextiles are mostly used for roads and parking lots. There are a few different kinds of woven geotextiles. Silt-film wovens have flat strands for strength while monofilaments have round fibers to create more uniform opening sizes for drainage applications. High strength and high-performance wovens can also be knitted or woven to achieve the desired performance characteristics. 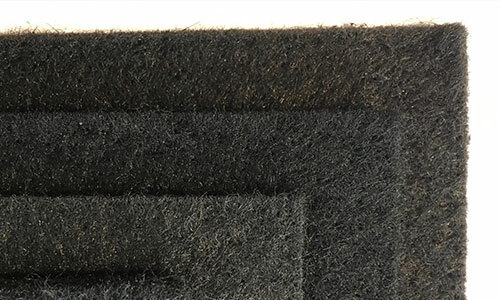 Nonwoven geotextiles are a more felt-like material also made from polypropylene or polyester fibers. However, instead of weaving two pieces of material together, they are needle punched and heat set. As opposed to tensile strength, nonwoven geotextiles are categorized by weight and are available in light-weight (3-5 oz), medium-weight (6-8 oz), heavy-weight (10-16 oz), or ultra heavy-weight (100 oz). They are permeable and are mostly used for drainage and filtration. Embankments can be constructed on soft soil foundations with the help of a geogrid and/or a high strength geotextile. The geotextile and/or geogrid is used at the base to provide stability while limiting differential settlement. Doing this allows for the formation of higher embankments and steeper side slopes. Geogrids and geotextiles can work together to reinforce steepened slopes. They are placed in layers during construction to provide tensile resistance and enhanced stability for the steepened slope. To enhance aesthetics, the face of the slope can be wrapped with geotextile and vegetated. Geogrids and geotextiles can also be used to create a reinforced soil wall or retaining wall. Geotextile reinforced soil retaining walls allow contractors to use on-site fill and gives them a variety of facing options such as segmental concrete blocks, treated timber, natural stone or vegetated facings. IWT Cargo-Guard offers factory seaming of geotextiles to custom widths and lengths. Seaming capabilities range from nonwoven, slit-film wovens and monofilament wovens to the high performance/high-strength polypropylene (PP) and polyester (PET) geotextiles. We also offer off-line slitting and re-rolling with fast delivery to your job site. If you’re looking for geotextiles in custom roll sizes or factory seamed panels, contact us today to get started!